We’re into the third month of cook it 2012, and I’m pretty excited about the most recent undertaking. 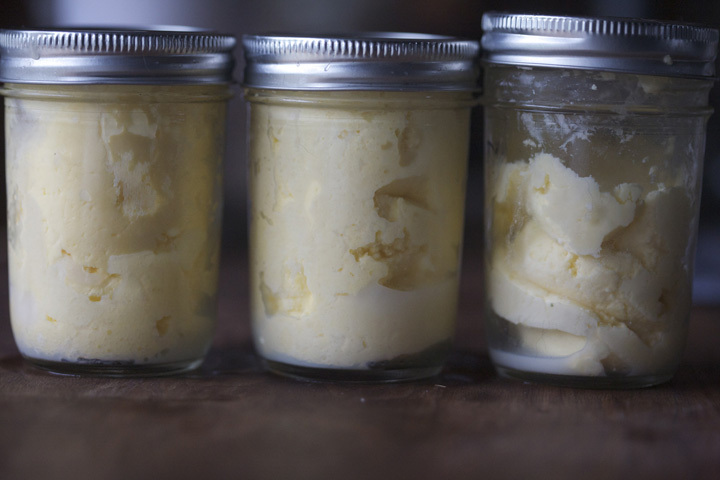 So far I’ve tackled pasta-making and bread-baking, and now… butter. 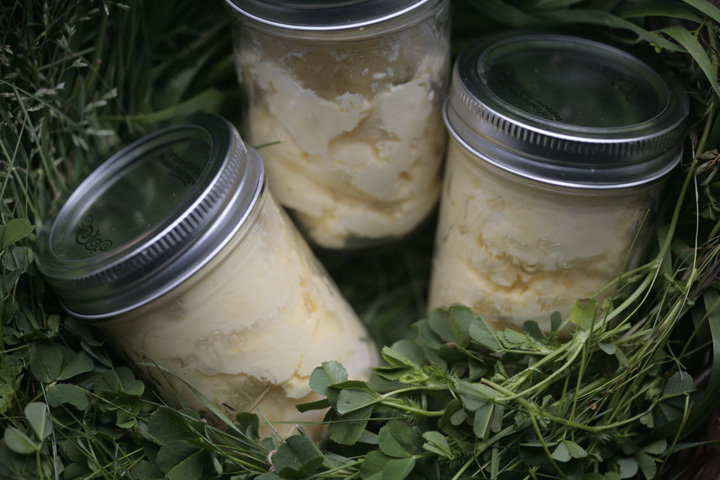 I’ve been wanting to make butter ever since I read this great post here from the Hungry Tigress. I’m all about DIY, and my olive tree is still really small and not looking very promising in the olive oil department, so making my own butter can fill the void for right now. The little pints of cream that I bought weren’t cheap at all. The flavor is absolutely amazing, though. I remember the first time I ate an heirloom tomato, the first time I tried foie gras, and now, the first time I tried real cream. It has officially joined the ranks of formative culinary experiences that will forever change how and what I want to be cooking. It makes coffee taste a million times more delicious, and I can’t wait until berry season – I need to have blueberries and cream in my life, all the time. Wait, I really like whipped cream. I should just make whipped cream right now, not butter. Lemme go bake a pie real quick to go with this. Put the cream in the bowl of a stand mixer fitted with the paddle attachment. Mix on high speed for awhile. The cream will turn to whipped cream, and then separate into butter and buttermilk. 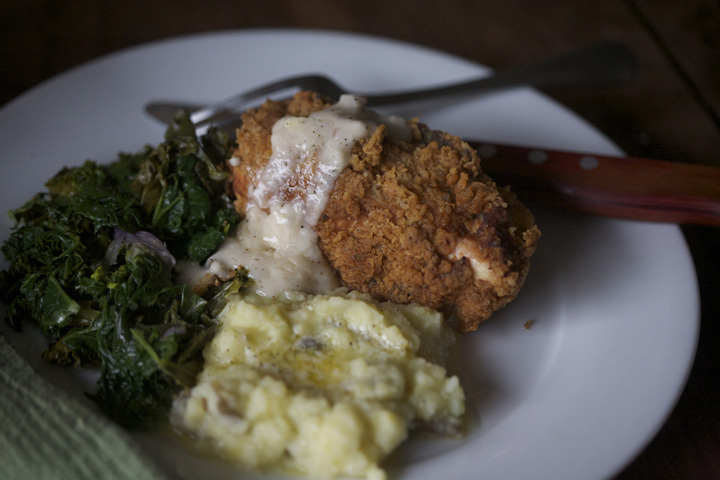 Drain the buttermilk into a bowl and reserve it for the fried chicken (or whatever you want to make). Use a wooden spoon to smoosh all the butter into one big clump. 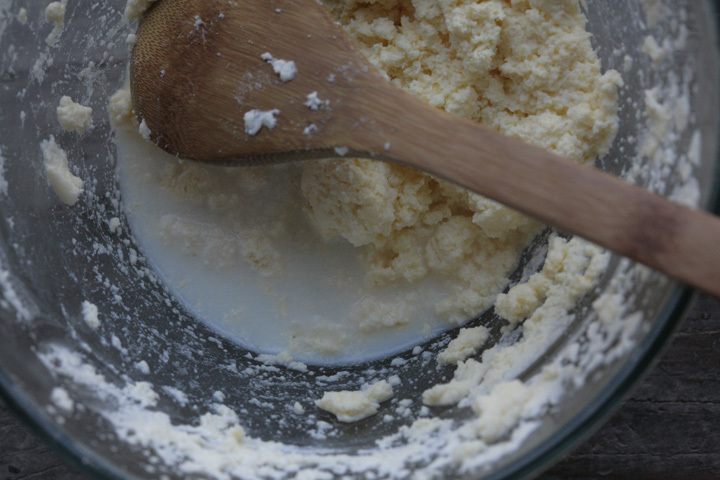 Take the bowl off the stand mixer and go over to the sink with it… Run cold water over the butter and press down with the spoon to get out any remaining buttermilk (just dump it down the sink, there won’t be much at this point). Pack the butter into jars. They last for about a week in the fridge and freeze very well. 1 tbs. fresh herbs, minced- any combination of thyme, oregano, rosemary sage, whatever you have…. 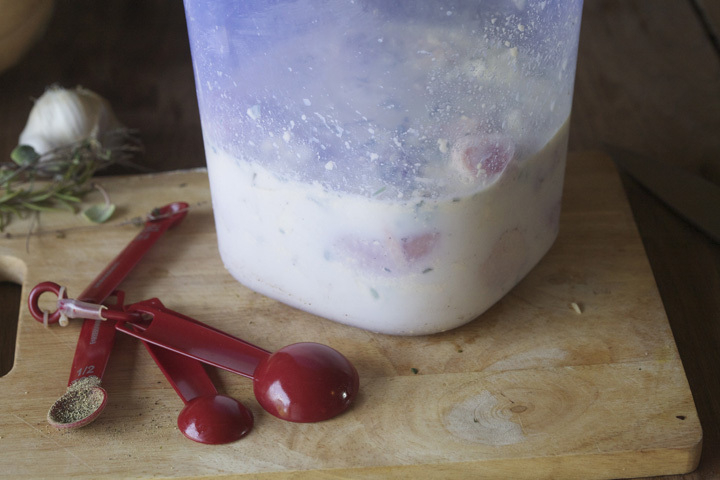 Combine all the ingredients for the marinade in a large container. Add the chicken pieces. Cover and refrigerate for 8 hours or so. Heat up the oils in a large, heavy-bottomed pot (I use my jam pot for frying as well). If you have a thermometer, heat the oil to 350 degrees. If you don’t have a thermometer, you can test that the oil is hot by putting a drop of water into the oil. If it’s hot, the water will sizzle like crazy. Once the oil gets hot, you can probably turn the heat down to medium high or medium. Important: Don’t rush the oil. Make sure it’s hot. If you put the chicken into lukewarm oil it will be gross and turn out all greasy and soggy. At this point you should also preheat the oven to 350 degrees. While the oil is heating, combine the ingredients for the breading in a large dish. Remove the chicken pieces from the marinade. Try to give them a good slosh around to make sure that you get lots of marinade on the chicken as you remove each piece. Roll around the chicken pieces in the breading, making sure to thoroughly cover each piece. 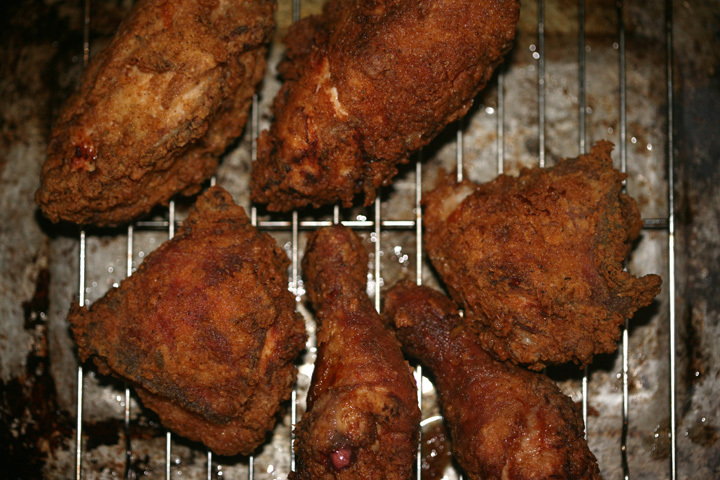 Once the chicken is breaded and the oil is hot, put the chicken pieces in the oil to fry. Work in batches so that each piece is surrounded by plenty of oil- you don’t really want the pieces to touch each other while they’re frying. Cook the pieces for about 10 minutes, until they’re looking nice and golden brown. Transfer the pieces to a pan with a rack and put them in the oven to finish (The rack is important! If you put them right on a pan the breading will get soggy). The chicken will probably need about 10 minutes in the oven to finish all the way, but the time will vary depending on the size of the pieces. Check for doneness with a thermometer; it should read about 165 degrees. with a link to your post by April 15, 2012 at 12 PM (PST). *J. saw me putting bacon grease in the cooking oil and was skeptical, I believe based on health reasons. It’s fried chicken though. It’s inherently not a healthy dinner choice. Save healthy for a different night. I usually advocate a diet with lots of fresh fruits and vegetables and very little meat, but if you’re going to do fried chicken, you might as well just go for it. **I used to cringe at the price of organic chicken, but then I tried it and realized it’s far superior to the conventional equivalent. The meat is richer and… my friend Paula from Mendocino Organics described it as “more chickeny.” They have a chicken CSA where you can get humanely raised delicious organic chicken, perfect for this recipe. Great resolution – I am working on only making butter and not buying any! I have so wanted to try that raw cream at the UNF, but couldn’t bring myself to pay 11.99 for it. But after reading your post, I will have to reconsider. Also, this post hits home, as I am an avid butter lover. We’ve been eating Kerrygold butter exclusively as it just tastes better than others, but I may have to spring for the raw cream version and make some. Thanks for the inspiration! My Cook It 2012 is a little less ambitious, but I do plan to perfect beautiful cupcakes by the end of year. I make a new kind of cupcake each month. And destroy a pastry bag each month and just slap the frosting on. They still taste delish. The elusive French Macarons will one day not be just a store bought treat. awildflowergirl- I’m jealous that you have a farm with all that good milk nearby! karen- you should try it! I think i’ll probably use it for special things. If I need a lot of cream, it’s too expensive, but for smaller things I can deal with the price. rita- cooking would be a blast! your cupcake project sounds great… let’s see some pics sometime… feel free to share any tips that you learn along the way. Caroline: It looks like I may not be able to find raw cream for this challenge. If I have to use pasteurized, should it be heavy cream or whipping cream? THANKS! hi- so, since I’ve only done this a few times i’m not a total expert about the different brands & types you can use since there are so many combinations of pasteurized/ultra-pasteurized/heavy cream/whipping cream/etc. I’m fairly certain that you want to look for pasteurized heavy cream. 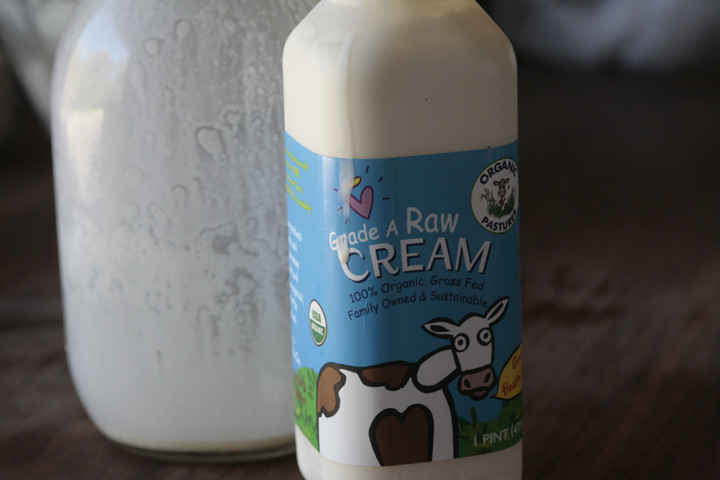 Our natural food store also sells Strauss brand cream which is pasteurized but still organic and high quality. unfortunately i haven’t tried any of the conventional grocery store brands to see what works. Just read the ingredients- i think sometimes whipping cream has stabilizers in it that you don’t really want for this. I’m pretty sure if the ingredients are just “cream” then you’re good. Let me know what you find out! I hope this helps a little bit. My gut feeling was to go with heavy cream, not whipping, if I have to use pasteurized and, since you concur, that’s what I’ll try. I’ve got one more place to check for raw cream so I still might be able to go that route. Thanks!